The typical amount that an adult needs is 3 capsules of Dr. Keller’s Original Glutathione Formula twice a day, three in the morning and three mid-afternoon. Some people increase to 9 capsules per day if needed (especially individuals who weigh over 220 lb or serious athletes). If you have a chronic illness, then you might want to start slower (e.g., 1-2 capsules in the morning and 1-2 in the afternoon), and build up from there. If you have an autoimmune disorder, it’s suggested that you start with one capsule for five days, then go up to two capsules, and every five days increase by one capsule until you’re up to 6 capsules a day. If at any point that you start to feel worse, go back down to an amount that doesn’t make you noticeably detox. Make sure you drink a lot of water, especially if you start detoxing. Drink approx. ½ oz. of water per pound of body weight (e.g., a person who is 140 lbs, should drink 9 cups of water a day). Initial detoxing – this could include mild headaches, diarrhea, constipation, etc. Results typically improve with continued use, with most people reporting even better results after 3 months. If you stop taking the product there is a gradual decline in results for about 60 days. At that point you’ll feel as if you have never taken it. Although most people don’t experience detox reactions, if you do, this is a sign that the product is working and your body really needs it. The typical reaction to the expelling of toxins involved during a detox reaction involve flu-like symptoms including, but not limited to, brain fog, headache, sore throat, a feverish feeling, joint or muscle discomfort and fatigue. For those experiencing a detox reaction, it is recommended that they decrease the supplementation down to 1-2 capsules a day, drink plenty of water, eat wholesome, fresh foods, and gradually increase the supplementation amount. A good guideline is 1 capsule of Dr. Keller’s Original Formula for every 25 lbs. of weight per day. I would start with just a 1/3 of a capsule, and then gradually work your way up from there. If your child is 50 lbs, you would gradually work your way up to 1 capsule in the morning and 1 in the afternoon. If your child cannot swallow a capsule, you can open up the capsule and mix contents in apple sauce, yogurt, juice, shake, oatmeal, cereal, on toast, etc. Allergy warning: Dr. Keller’s Original Glutathione Formula is derived from mushrooms and shellfish. The information described herein is not intended to treat, cure, diagnose, mitigate or prevent any disease. 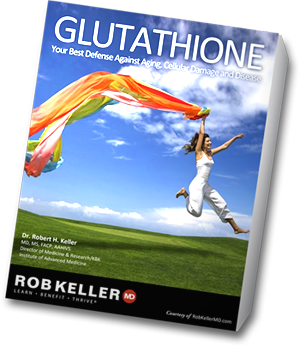 Dr. Keller’s Original Glutathione Formula does not cure or treat any disease or illness. It simply gives your cells the nutrients they need to produce more glutathione, which in turn helps every cell function better.